1. Place cashews in a large bowl and cover with water. Add 1 teaspoon of sea salt, stir and let soak at room temperature for about 1.5-4 hours (overnight is fine). Drain and rinse. 2. Place cashews in a blender, add all other cashew cream ingredients and blend on the highest setting until completely smooth. Season to taste. Set aside. 3. Heat coconut oil or butter in a large stockpot. When melted, add onions and a few pinches of sea salt, stir, and cook until the onions have softened, about 5-7 minutes. Add garlic stir, cook for a few minutes. Add the broth, and bring to a boil. Add the broccoli florets and simmer for just five minutes – do not overcook, broccoli should be bright green. 4. Remove about half of the cashew cream from the blender and set aside. Add the stockpot contents to the blender (you may need to do this in batches) and blend on the highest setting until smooth. Add the nutritional yeast, parsley, and lemon juice. Blend on high until smooth. Season to taste. 5. To serve, pour the soup into bowls. 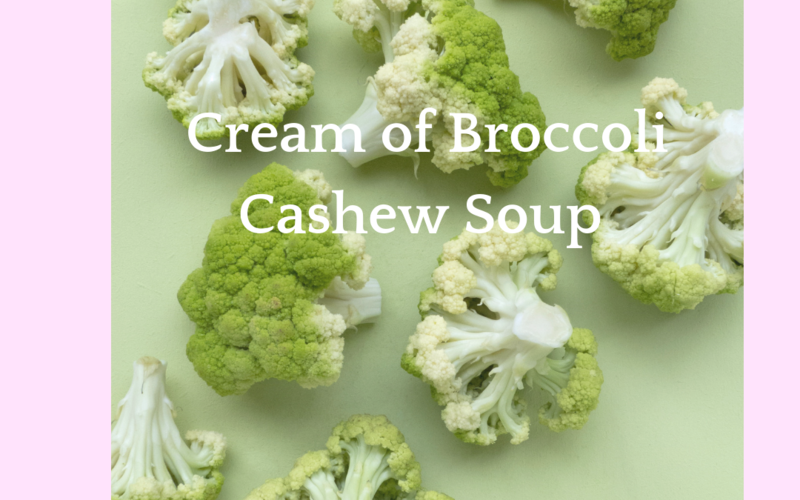 Add a few spoonfuls of the leftover cashew cream and swirl into the soup. Sprinkle with chili flakes and a couple parsley leaves. Enjoy hot!